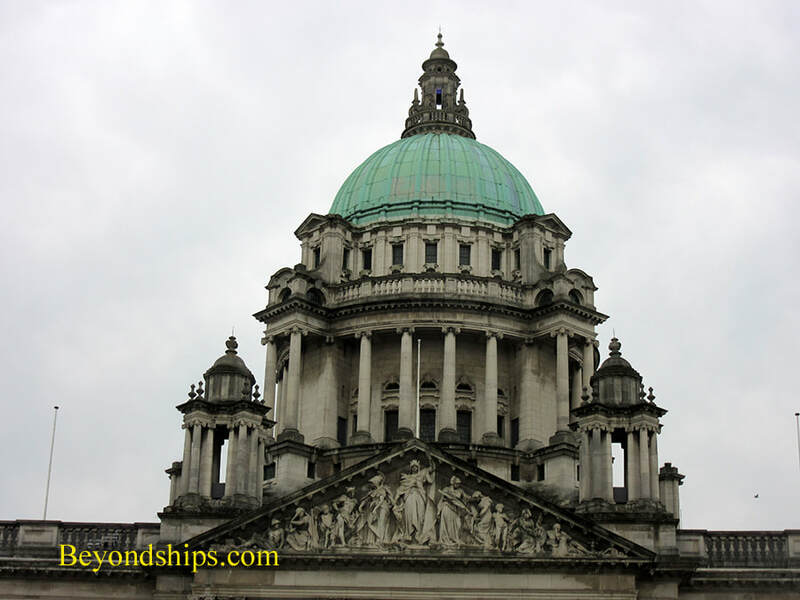 Belfast is the capital of Northern Ireland, part of the United Kingdom. It is relatively small with about 480,000 people living in the city and surrounding communities. Not all that long ago, the idea of a cruise to Belfast would have been unthinkable for most people. However, following the Good Friday Agreement of 1998, the sectarian violence between Protestants and Catholics (known as “The Troubles”) has greatly subsided and Belfast has become a tourist-friendly city. The city is dotted with new buildings reflecting the prosperity that followed the end of the violence. 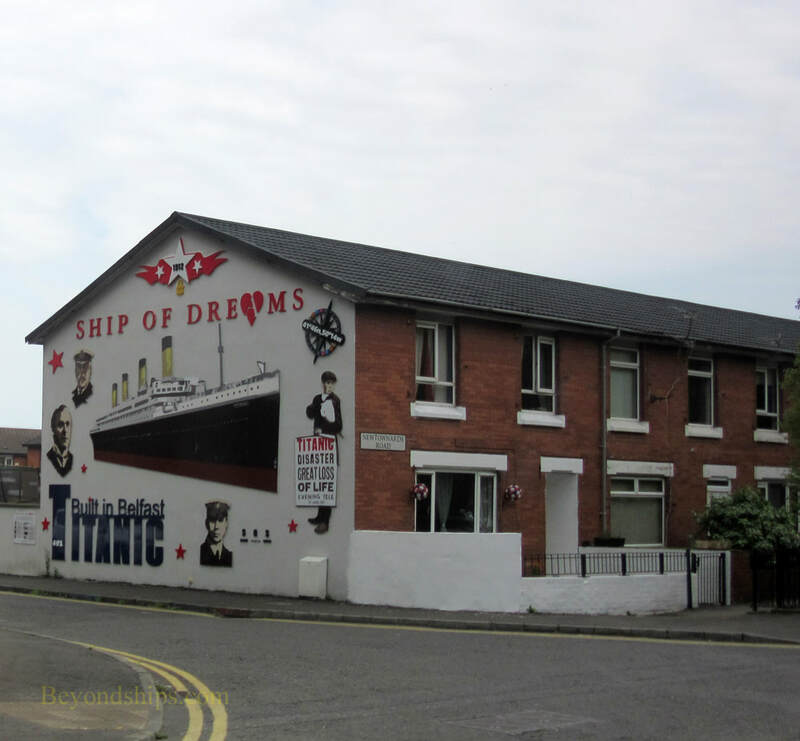 For example, the Titanic Quarter, once a vast industrial ship building area, has been re-developed so that much of it is park-like and/or has been turned to other innovative uses. Reflections of Belfast's past can be seen in the giant cranes Samson and Goliath towering over the Harland & Wolff shipyard. Grand Victorian and Edwardian buildings punctuate the city center recalling the days when Belfast was an important center for linen manufacturing, rope making, and tobacco production as well as shipbuilding. .
Large murals painted on the sides of houses and on walls in Belfast's more residential areas tell of more recent times. Quite a few relate back to the Troubles and carry political messages. Others look to the future. Belfast is not as pretty a city nor as well-developed as Dublin, its rival in the Republic of Ireland. The city clearly suffered from its lost years. However, there is a spirit in Belfast that is trying to make up for lost time. 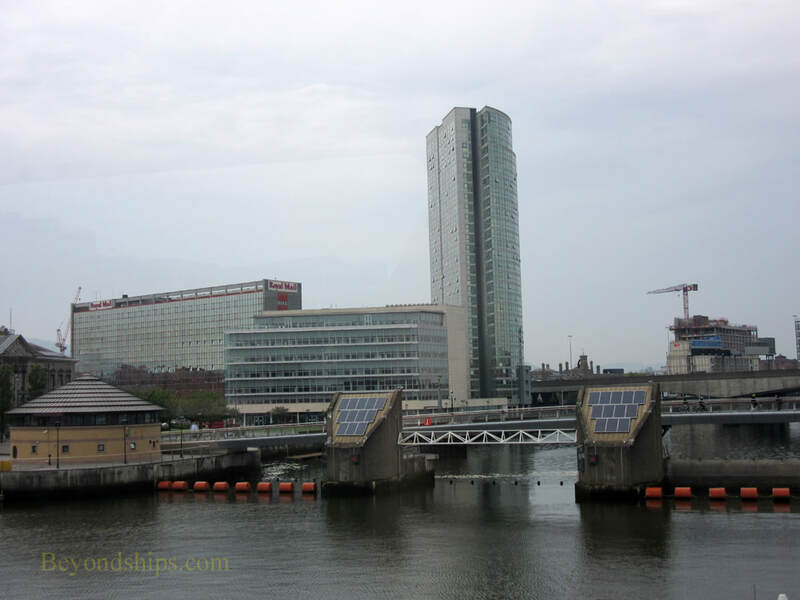 The Titanic Quarter, which encompasses the area on Queen's Island where Titanic was built. The Cathedral Quarter, the area around St. Anne's Cathedral. It has become a center for arts and culture. The Queens Quarter is the area around Queen's University. It has a young population and a more suburban atmosphere. The Gaeltacht Quarter where the use of the Irish language is encouraged. As part of the United Kingdom, the currency is the British pound sterling. The official language is English although some people also speak Gaelic. Even in summer, the temperature in Belfast can be quite cool. Belfast has an average of 213 days a year with at least a millimeter of rain. Above: Belfast is gaining a modern skyline. Left: The Rise sculpture is the biggest public sculpture in Belfast. It symbolizes the rising of the Sun and hope for Belfast's future. 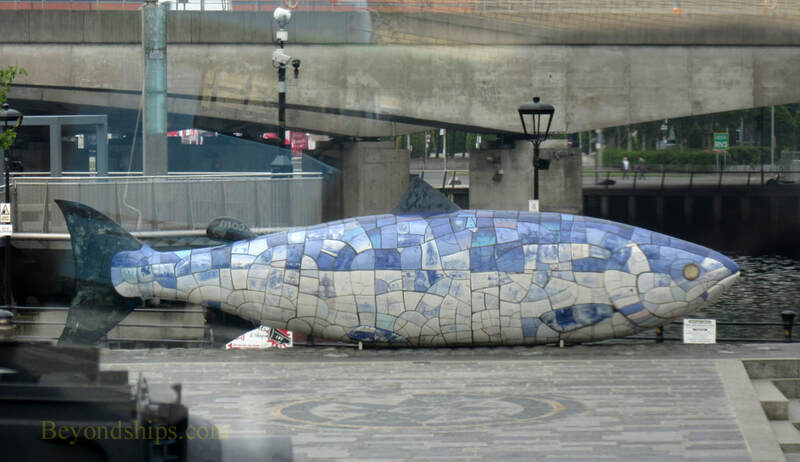 Above: The Big Fish is a sculpture of a giant salmon. It was commission in 1999 to commemorate efforts to revive the River Lagan. 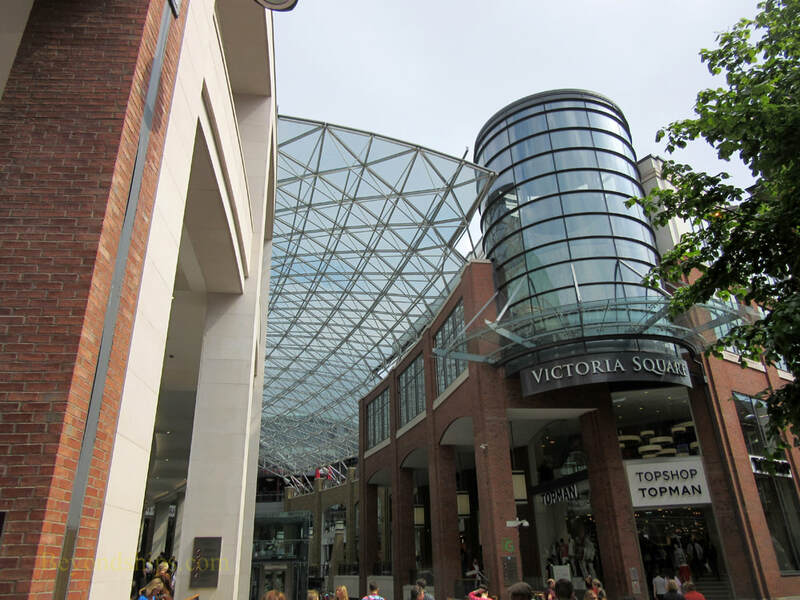 Above: Victoria Square is a large shopping mall in downtown Belfast. It was built at a cost of $641 million and opened in 2008. A large dome sits atop the structure, which has a viewing area with panoramic views of the city.